This mod will allow you to change your Scania truck to a dark red solid interior. When you are using this interior mod, it should be noted that almost 99% of the truck will contain a very darkish, yet sometimes reflective interior. This skin should work with all versions of the game and should apply to all Scania trucks in the game. 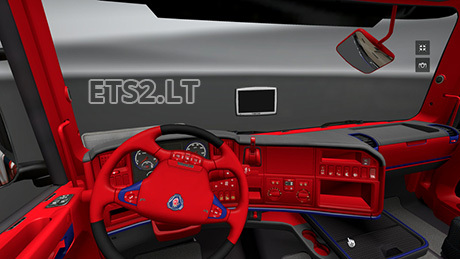 This skin will most likely not work with any other interior mod for the Scania truck series..
Current time: 04-23-2019, 05:14 PM Powered By MyBB 1.8.20, © 2002-2019 MyBB Group.